Gout is characterized by severe pain, inflammation, redness and tenderness, and heat at the joints, such as the knees and big toe. Uric Acid is a product of the breakdown of purines, an organic compound that can be found in our DNA. It is filtered from the blood by the kidneys and is excreted in urine. However, high levels of uric acid, a condition called hyperuricemia, can wreak havoc on our joints. Once it is formed, uric acid does not easily dissolve in water, therefore, at high concentration, it can get deposited in our joints and form microscopic crystals. These crystals irritate our joints as we move and can cause severe pain and inflammation a condition called Gout. Gout is classified as a form of inflammatory arthritis that is characterized by severe pain, inflammation, redness and tenderness, and heat at the joints, such as the knees and big toe. This condition tends to manifest at night. Hyperuricemia is found in almost half of the people that are diagnosed with gout. Luckily, a simple blood test will show your doctor if you have hyperuricemia and can also help determine the reason why. There is a lot of information that is given in a blood test. For gout, a doctor will focus on your level of uric acid and the filtration rate of your kidneys, indicated by the glomerular filtration rate (GTP). By looking at this information, the doctor can determine if the increased level of uric acid is caused by it’s over production or if the kidneys are having trouble filtrating it from your blood. High levels of uric acid will not necessarily result in gout, but this combined with symptoms of pain and inflammation in your joints will likely lead its diagnosis. 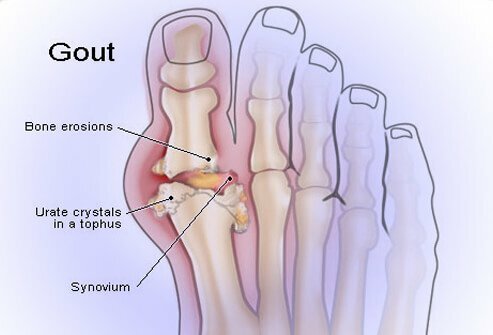 Gout can also be diagnosed by testing synovial fluid, a material that surrounds the joints, for the deposited crystals called monosodium urate crystals. There are several factors that can increase your risk of developing gout. These include diet, genetics, medical conditions, and medications. There are foods that can increase your level of Uric Acid, such as organ meats (liver), beef, pork, lamb, seafood, fish, asparagus, beer, mushrooms, cauliflower, spinach, and more. These foods are high in purines and avoiding them will decrease your risk for developing gout. There are also genetic conditions that lead to chronic increased levels of uric acid, such as familial hyperuricemia neuropathy and medullary cystic disease. However, these disorders are rare and may not necessarily lead to gout. Certain medical conditions, such as metabolic syndrome and kidney failure increase the risk of developing gout. Finally, taking some medications such as diuretics, aspirin, and niacin also increase the risk. Treatment of gout starts by treating the symptoms of pain and inflammation with NSAIDs, such as ibuprofen, and steroids. Colchicine is then given to reduce crystals and prevent further attacks. Left untreated gout could resolve on its own within seven days, however, it can also lead to a second attack and kidney damage. By taking small steps, such as changing your diet, you could lower your chances of a gout attack, however, if you have any of these symptoms, by performing a simple blood test, a doctor can give you peace of mind to the root of your joint pain.